"An exclusive collection of the hottest new shades inspired by the runway. Includes a limited-edition sliding mirrored palette packed with 4 shadows, 3 liners and a double-ended brush, 2 gorgeous shades for cheeks, plus a double-ended gloss to inspire countless looks for day or night. Also available at UltaAn exclusive collection of the hottest new shades inspired by the runway. Includes a limited-edition sliding mirrored palette packed with 4 shadows, 3 liners and a double-ended brush, 2 gorgeous shades for cheeks, plus a double-ended gloss to inspire countless looks for day or night. Also available at Ulta." "Get it Girls!! This is an AWESOME DEAL! I love how this even comes with a Angled Brush...most kits do not come with a travel sized brush!!. Also when you order from Smashbox.com, you get FREE JUMBO SAMPLES. So grab this deal before there all gone!!" 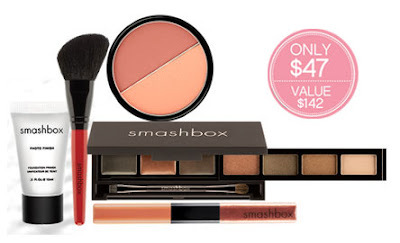 "Smashbox also is offering FREE SHIPPING on any orders through their website!" OOO looks like a good deal! Don't forget to check out my new Lady Gaga Look Contest! this looks like a really got kit to have!